Last month my parents came to visit me in Utah for the first time ever. While I’m big on the outdoors, my dad is more of a see nature from the car kind of person. They enjoy good food, national parks, and off-roading via motorized vehicles. I planned an adventurous family road trip that I thought all of us could enjoy. They flew into Vegas and rented a Jeep then drove to my home in St. George, Utah to pick me up. It turns out my dad forgot to pack shirts, so we had to make a quick shopping trip before we could depart. On the drive out, we made a pit stop at Cedar Breaks National Monument. There’s just a short little walk up a hill to see the giant canyon below. It was right along our drive, so a worthwhile detour for good views. 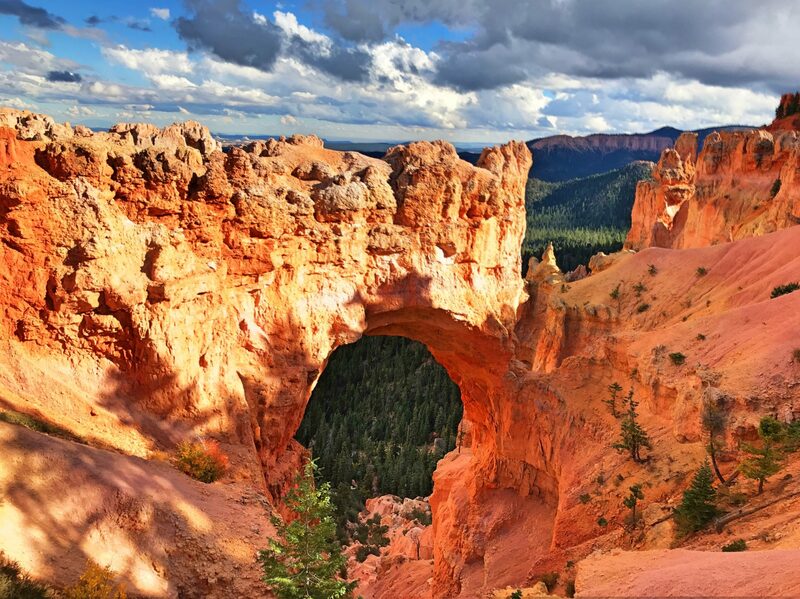 A couple hours later, we cruised into Bryce Canyon National Park in search of more viewpoints. Did I mention my family enjoys nature most from the road? My parents on day one of the adventure. Our destination for the day was Boulder, Utah. Boulder is a tiny town north of Escalante National Monument. I first visited the town last spring when I did my Wilderness First Responder recertification course there. Other than being a remote ranch town with a population just over 200 people, they are home to Hell’s Backbone Grill and Farm. I’ve heard my friends rave about how delicious the food is at Hell’s Backbone. Additionally, the farm also grows their own fruits and vegetables and source their meat from local ranchers. The goal of stopping in Boulder was to go to this restaurant, and it didn’t disappoint. Other than being literally the best meal I’d had in months, it had friendly vibes all around. One of the owners stopped by our table to chat. As I was sipping on my pear cocktail, an employee told me she had squeezed the pears herself that morning. The next morning my mom even insisted on returning to buy their cookbook. Wanting to give my parents a bit of a camping experience, I booked a glamping tent at Boulder Mountain Guest Ranch. It immediately had a home-like feel. The owner herself showed us to our tent and answered our curious questions about how she runs a guest ranch in such a remote place. In my perspective, the tent was pretty cushy with giant soft mattresses and a canvas roof that the rain pattered on while I fell asleep. In my parents’ perspective, they were really roughing it because the bathroom was outside and the electricity stopped working. The next morning, we took full advantage of having a Jeep rental and set off down the Burr Trail Road. It was about 50 miles of mostly dirt roads that went through a canyon, down wild switchbacks, and through the Southeast side of Capital Reef National Park. Starting the Burr Trail drive. Finding a slot canyon along the side of the road that we could easily hike into. A switchback road that was on a hillside so steep that I probably wouldn’t even want to hike down it, let alone build a road down. Seeing such a wide stretch a nature with absolutely no houses nearby. It’s rare to find places in the US that are undeveloped for so many miles. My dad kept pointing out how far we had driven without seeing any signs of human life. Driving in through the backside of Capital Reef. The treacherous cliff on Chicken Corners Trail. My mom was our fearless driver. Our destination for the night was Moab, Utah. Not wanting me to book anymore glamping accommodations, my parents found us a hotel in downtown. My parents live in the country-side of Ohio, and a popular activity amongst their friends is driving side-by-side vehicles. My mom had just got one the month before. They said that all the side-by-side enthusiasts want to make trips to Moab. So of course they had to go off-roading while in Moab. After a quick stop to fill the cooler with beer, we began our journey along Chicken Corners Trail by driving out of town. The dirt road took us by some petroglyphs and campsites before we began our uphill acsent. Having just learned how to drive side-by-sides the month before, by mom took it slow. A runner on foot even passed us twice. Finally, the trail led to the top of a cliff. For over 30 minutes we drove alongside a 300 feet drop-off, with dirt bikes zooming by and twisting turns. I have a fear of heights, so I sat in the back seat not wanting to look down and sucking down beers for courage while my parents teased me about how I’m supposed to be the adventurous one. We made it off of the treacherous cliff and onto more mellow terrain. After a wrong turn, we almost got stuck in the mud. We even saw a giant tortoise, which was the pet of a guy who lives at the basecamp for off-roaders. The drive back along the cliff wasn’t so bad once I had a buzz going. We cruised back into town and had some dinner. Getting the most out of our Jeep rental. The next day I wanted to plan a scenic drive for us in the Jeep. I read about a Jeep road in the La Sal mountains that sounded appealing. I assumed because it was a road it wouldn’t be too bad. I was very wrong. The day was rainy and cold. The drive took us up rocky, steep roads. We couldn’t see any views because of the bad weather. It was muddy and scary. After two hours, we were almost to the top and past what was supposed to be the worst of it. Then we ran into some side-by-side drivers who said that there was a giant boulder blocking the road and there was no way around it. We had to turn back and drive back down the muddy road. A group of cows decided to get in front of the Jeep and let themselves be herded down the mountain. Eventually we made it back where we had come from and did a more pleasant scenic drive around the La Sal mountains on a paved road. We began the long drive back to St. George, Utah, thus ending our adventurous family road trip. A rad slot canyon that we found along the Burr Trail. Getting a National Parks pass and hitting up as many parks as possible. We have 5 in Utah, and the pass is good for a year for every national park. Renting a side-by-side and off-roading in Moab.